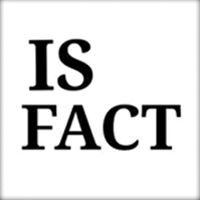 The Twitter account “IS FACT” is an ISIS propaganda account dedicated to “correcting” reported news and information online. The account launched June 24, 2015, and has accrued over 2,000 followers. IS FACT’s account’s profile page says it is based in “Unfortunately Daar Al Kufr,” or “land of the non-believers.” The account appears to be maintained by several people. The profile page instructs users to send questions as direct messages to the administrators @iroha_flower80, @shariatuna, and @Halummuu.IS Fact, Twitter page, accessed July 24, 2015, https://twitter.com/FACTOFIS. Iroha_flower80’s profile page claims she is a 19-year-old girl from Japan who is a “member of @FACTOFISIS.”Iroha, Twitter page, accessed July 24, 2015, https://twitter.com/iroha_flower80. Shariatuna claims to be from Indonesia dedicated to “khilafah [caliphate] upon the prophetic methodology, international relations, @FACTOFIS, loving and hating for the sake of Allah.”Shariatuna, Twitter page, accessed July 24, 2015, https://twitter.com/shariatuna. Halammuu has been suspended. In addition to retweeting @FACTOFISIS, @Iroha_flower80 and @shariatuna both post pro-ISIS propaganda in English on their personal pages. A July 30, 2015, post called Iroha_flower80’s profile a fake and warned about a mirror FactOfISIS account that posted anti-ISIS messages.IS Fact, Twitter post, July 30, 2015, 8:20 a.m., https://twitter.com/FACTOFIS/status/626729150288494592. As of July 2015, the profile page instructed readers to send questions as direct messages to the administrators @iroha_flower80, @shariatuna, and @Halummuu.IS Fact, Twitter, accessed July 24, 2015, https://twitter.com/FACTOFIS. By August 1, 2015, those instructions had been removed. Other posts have “revealed” online photos of purported ISIS atrocities as mislabeled photos from other conflicts. 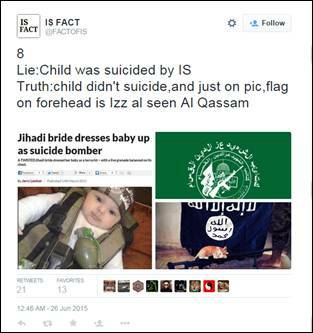 IS FACT has also claimed some pictures of ISIS atrocities are actually mislabeled movie clips. @FACTOFISISIS Fact, Twitter page, accessed July 24, 2015, https://twitter.com/FACTOFIS. 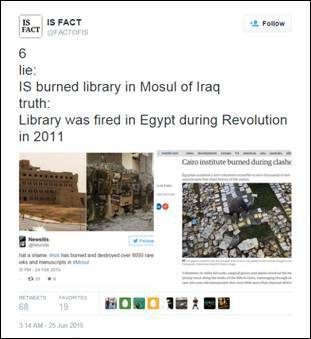 The Twitter account “IS FACT” is an ISIS propaganda account dedicated to “correcting” reported news and information online. truth: The pics are from Lebanon & they were re-enacting a non-Islamic Shiite ritual” (Tweet)IS FACT, Twitter post, July 1, 2015, 9:28 a.m., https://twitter.com/FACTOFIS/status/616237043245420544. truth: he's a sorcerer in Raqqah” (Tweet)IS FACT, Twitter post, July 1, 2015, 10:55 a.m., https://twitter.com/FACTOFIS/status/616258874811625474. 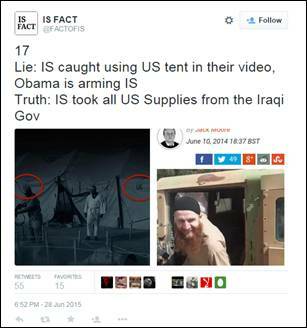 Truth: IS took all US Supplies from the Iraqi Gov” (Tweet)IS FACT, Twitter post, June 28, 2015, 6:52 a.m., https://twitter.com/FACTOFIS/status/615291696981524480.